Attestation ensures the credibility of every document and thus holds a significant role while visiting foreign countries. 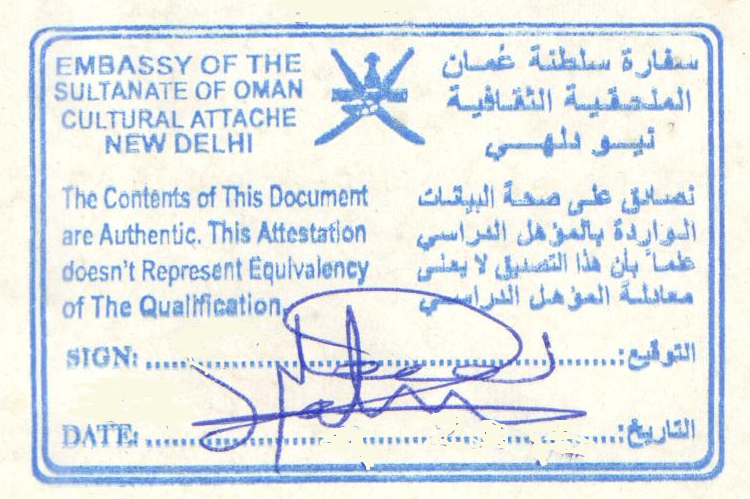 Oman is by no further means different, one has to do attestation prior to visiting. Not being a member of Hague Convention makes attestation procedure mandatory in Oman. Whether it's personal of commercial documents attestation is must to make sure the documents are genuine. In order to avail a valid visa one has to attest all educational/Personal certificates, professional or academic, issued from India by the Indian Embassy/Consulate in Oman for further attestation by the Ministry of Foreign Affairs of Oman Government before grant of Oman Visa. For processing of these documents it takes around 15 to 20 days. Attestation services are offered in the embassy of Oman for all types of educational and marital documents giving the applicant right to enjoy legal prerogatives. As per the new rule certificate attestation is now must to get a job in Oman, so next time you are planning a visit to Oman or got a job, we Arabian Attestation and Travels will help you out in all your attestation needs. Just give us a call or drop us a mail and our friendly team at Arabian Attestation and Travels will get back to you. With years of experience and a huge client base, we will resolve all your attestation issues in no time. The Oman Attestation undergoes in a choice of locations in India including, Chennai, Bangalore, Mumbai, Delhi, Hyderabad, Lucknow, Jaipur, Bhopal and Kerala. Just give us a call or drop us a mail and our team of professionals will help you out with the attestation service.